What will the car of the future look like? Will it actually drive you to work, while you seamlessly access email, catch up on the morning’s news, attend a video conference, and more? Maybe you’ll be able to send your car to pick up your son from his soccer game while monitoring the trip from the comfort of your own home. Your future car will act as your mobile office, the ultimate entertainment center and maybe even double as your nanny, all while enveloping you and your passengers in the best safety features that future tech has to offer. Your future car will help reduce stress (no more sitting in traffic wasting time), reduce boredom (watch the latest movie on your commute home) and keep you safe. This sounds pretty amazing, right? Well we’re not there yet… but will be soon. All of this technology requires specialized processes and equipment to build. This article explores some of this technology and what it takes to make today’s modern cars so smart, as well as how we are getting one step closer to that future car. The amount of gadgets in today’s automobiles is simply mind-blowing. 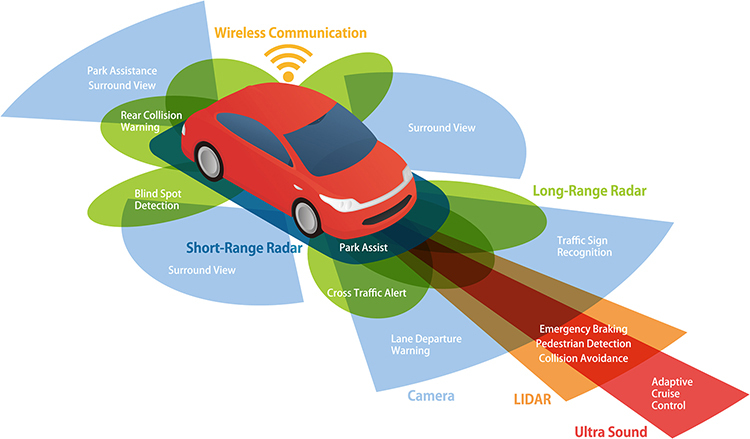 A car purchased now might be equipped with: Advanced Driver Assistance Systems (ADAS), autonomous driving features (hands-free driving), endless safety features (back-up cameras), any number of a variety of automotive infotainment options (WIFI, satellite radio), and more… Because of these features, we have grown to rely on our cars for everything from entertainment to the safety and security of our loved ones. The global market for automotive electronics is growing steadily and is estimated to exceed *$185B by 2018! Let’s look at just a few advances in technology present in today’s cars; specifically LED headlamps and Occupant Classification Systems (OCS) modules. Manufacturing these devices presents a unique set of challenges, including custom processes, specialized equipment and manufacturing expertise. No matter where you are, take just a few seconds to look around you. There’s a good chance that right at this very moment you’ll be able to spot at least one place, if not several, where light emitting diode (LED) technology is used. One of the most common applications is that of status indicator lights on electronic goods such as computers, televisions and handheld devices. The bright light produced by LEDs is also used for traffic signals, aisle floor markers in airplanes, and for a while, LEDs were even a popular addition to kids’ sneakers. Anyway, you get the idea – LEDs are everywhere. 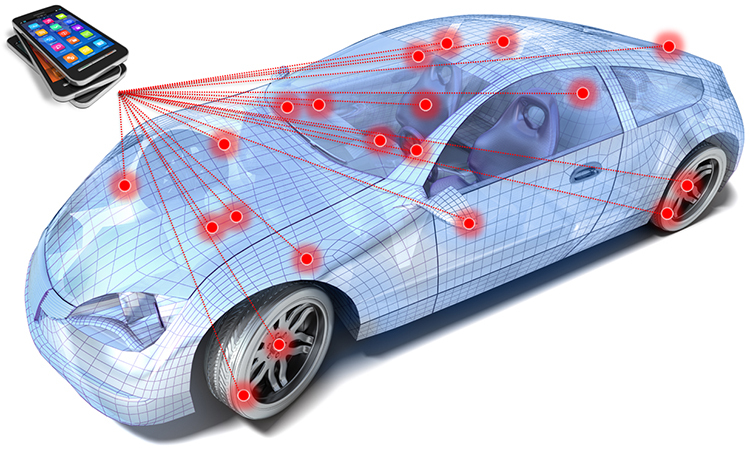 Of course, automotive applications are plentiful, too. LEDs are used for interior illumination, daytime running lights, fog lamps, and now LED headlamps, which are becoming a standard accessory on today’s higher-end cars. Why? LED headlamps are effective, efficient and durable. LED technology consumes less energy and produces more light than standard halogen headlamps. LED headlamps also provide instant illumination and are able to retain 90% luminance over their 15-year life span (average). LED Headlamps – What are the challenges? LED automotive headlamps have evolved into complex assemblies requiring ultra-precise processes to achieve extreme performance standards. High-accuracy placement and exact LED alignment are essential in building brighter and more adaptive (color direction, intensity) headlamps. Due to the materials used in these headlamps, they are also expensive to build. To address this challenge, Universal Instruments has developed a proprietary high-accuracy LED placement solution called Top-Side Alignment Process (TAP). This process is the ideal solution for LED headlamp assembly because it ensures economical, accurate, high-speed, and repeatable placement of LED components. How does the TAP process work? The TAP process is used to precisely place and align LEDs, leveraging the inherent accuracy of Universal’s FuzionSC™ Platform – the ultimate platform for high speed and high accuracy. In its essence, TAP establishes a relationship between the top-side and bottom-side component features in order to ensure exact placement of the LEDs. First, the LED is fed to the pick point in a tape and reel format, and the LED is picked by the FZ7™ head – up to seven at a time – and placed on the Precisor™ vacuum nest. Next, a top-side inspection of LED light-emitting features and the component outline is performed on the nest by the PEC downward-looking camera. The offset between the center of the LED light-emitting and the center of the component outline is then calculated. 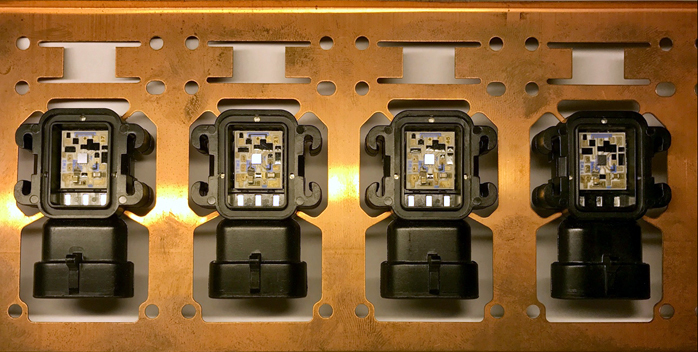 Following this, the component is then picked from the vacuum nest, and a Magellan™ upward-looking camera inspects the outline of the bottom-side of the component and applies the calculated body-to-feature offset to place the component based on the topside features. TAP process top-side and bottom-side feature inspection. Universal’s TAP process eliminates the inaccuracies of alternative solutions caused by part movement during a post-inspection (top-side only) pick process. And TAP also ensures accurate LED alignment without the need for a specialized camera to generate the offset calculation, as is required by alternative offerings. In addition, Universal’s 7-spindle placement head enables gang-pick and place on the Precisor for unmatched throughput and a significant reduction in the overall cost of assembly. Universal has successfully leveraged TAP for high-accuracy LED headlamps, CPV assemblies, camera sensors, and laser diode applications. Currently, Universal is the only provider to have TAP solutions for LED applications being utilized actively by its customer base. While airbags save lives, they aren’t perfect. For children and people of small stature, the impact of an airbag inflating at more than 200 mph can cause permanent injuries or death. This is the reason that drivers are told to put smaller passengers in the back seat. It’s a law in some states. But what if you are carrying several passengers in the backseat and have to put a child up front? What if you drive a two-seat car? For this reason, today’s modern car is equipped with Occupant Classification System (OCS) – a system of sensors that detect who’s sitting in the passenger seat. OCS eliminates the need for an on/off switch for airbags because it uses computer technology to identify whether an adult or a child is in the seat. The OCS doesn’t just detect weight. It reads the passenger’s seating position and determines if they’re wearing a seat belt. The system is designed to recognize whether a child safety seat is occupying a given seat or that seat is simply carrying some heavy objects (like groceries). A light or sign on the instrument panel tells the driver whether the passenger airbag is on or off. Once the onboard computer knows the passenger’s size and weight, the car’s dual-stage airbags come into play. Based on the occupants‘ size, these types of airbags can deploy at full speed, partial speed, or not at all. In addition, dual-stage airbags can also deploy at lesser speeds when the car is involved in a minor collision. Low-pressure seat sensor for OCS system. How amazing is it that something as small as an OCS can have such a big impact on our lives? Specifically, it can save our lives by determining the best scenario under which to inflate an airbag during an accident or impact – or not inflate the air bag at all. Occupant Classification Systems – What are the challenges? The design of an OCS must be robust to allow for performance in harsh environments such as extreme temperatures and vibration, thermal and mechanical shock, and chemical contamination. To build this type of module, multiple sensors must be aligned on a lead frame. Once the PCBs are populated they must be placed and secured within the plastic housing. The housing must be sealed and tested before being released into production. Universal is well positioned to offer comprehensive solutions for OCS system production. The APL can provide process, prototyping and development expertise, and the industry’s most extensive equipment portfolio includes solutions for both the board population and the final assembly of the unit. Universal also has years of experience integrating third-party equipment to deliver the best possible solutions. The Universal Applications team can design custom fixtures and nozzles for even the most unique requirements. The quality of the unit can even be insured through a complete production part approval process (PPAP) documentation. While the automotive electronics of today are quite impressive, there is an evolution developing around Flexible Hybrid Electronics (FHE). This technology is will enable automotive electronics devices to become smaller and smaller while delivering even more advanced functionality. 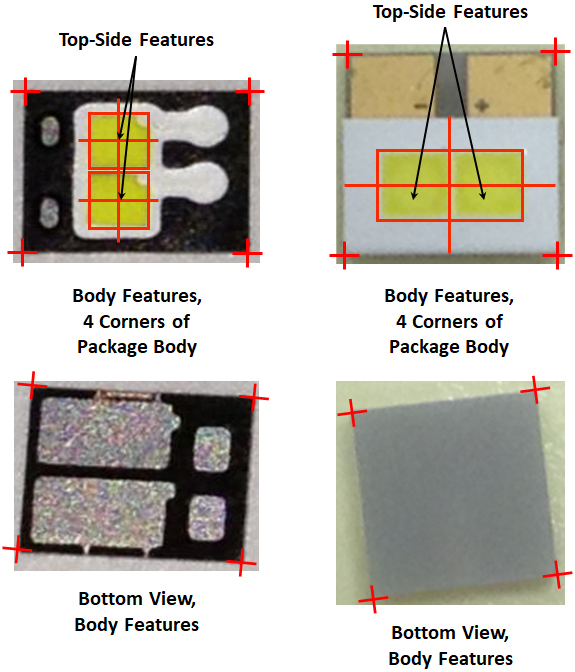 With FHE, manufacturers will create sensors that are lighter in weight and can conform to the curves of a human body or stretch across the shape of an object or structure – all while preserving the full operational integrity of a circuit. Now imagine using this technology to seamlessly integrate the equivalent of 20 mobile phones into a single car… along with auto-sensing, computing and transmitting. Think about all of that technology coexisting in the confines of your car – it’s astonishing. That’s what the market wants – and where we are heading. Market demands are driving automobiles that are brimming with complex electronics. Providing all of this functionality while maintain the imperative reliability of an automobile, including fail-safe, mission-critical hardware and software, will require specialized assembly capabilities, including thin die handling (<75-micron thickness), accurate placement on flexible substrates (<10-micron accuracy), efficient die and passive placement for System-in-Package (SiP), and high-volume flex circuit interconnect (parallel bonding). Universal’s solution for FHE is a combination of our FuzionSC semiconductor platform and Flexbond™ hot bar bonder – a flexible, high-throughput, integrated hot bar solution offering complete process automation for flux transfer, high-accuracy placement and hot bar soldering. FHE will allow us to eventually realize the car of the future; however, FHE is already being used in today’s cars to deliver all of the functionality we’ve grown accustomed to and continues to enhance the human driver experience. I am not certain what the car of the future will look, but I am certainly looking forward to seeing where all of this technology drives us (pun intended). Across many years of experience in the automotive industry, Universal has helped its customers build: transmissions/engine control modules, junction boxes, tire pressure sensors, OCS systems, and much more… Universal has provided uniquely advanced solutions to some of largest automotive manufacturers in world! This means that no matter what part of the car is presenting a challenge, Universal has the right solution and expertise– now and in the future. From the broadest range of technologies in the industry – from standard to extreme surface mount and through-hole to advanced semiconductor packaging and automation – to the prototyping capabilities and process expertise of the APL, Universal stands alone as a complete solutions provider. So, don’t spend time revving your engines; shift your manufacturing into high-gear and take advantage of Universal’s unique solutions to solve your automotive electronics assembly challenges today! Want to learn more about our Automotive electronics assembly expertise? Then visit us at Productronica in Munich, Germany on Hall A2, Stand 433 (November 14–17).